“In what way?” asked Timothy. “But it must have been easy to fake it just by saying you loved the government, even if you hated it,” suggested Timothy. “Couldn't people just play act?” asked Timothy. “They got tripped up by the headbands,” said Andrew. “How did that work?” asked Timothy. “So what went wrong?” asked Timothy. “How many died?” asked Timothy. The decades ahead will probably see an energy crisis so great that it dwarfs the financial crisis that began in 2008. The reason for the crisis is that global energy demands are increasing, caused by population growth and increased consumption in countries such as India and China; but our production of fossil fuels will not increase enough to keep up with this need. In fact, the global production of oil may soon begin to fall, and the global production of coal may start to decline between one and four decades in the future. Global oil production rose steadily between 1985 (when it was 60 million barrels a day) to 2005 (when it was about 85 million barrels a day). Since then there has been hardly any increase. Many experts predict that global oil production will soon begin to decline. The thesis that the global demand for oil will soon exceed the supply is the Peak Oil thesis. We know that in quite a few countries, oil production has peaked. 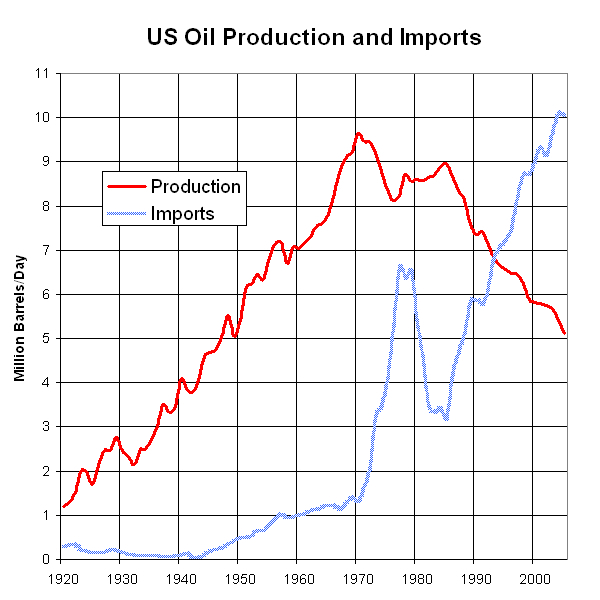 For example, the oil production of the United States peaked in the early 1970's, and has declined sharply since then. In a country such as Saudi Arabia, 60% of the oil comes from a giant field called the Ghawar field. But the Saudis have resorted to injecting huge amounts of sea water into the field (supposedly millions of gallons a day) to keep it producing at a high rate. If the field follows the typical production history for oil fields (that of a bell-shaped curve), the field's production will soon begin to steadily decline, as will many other oil fields. But what about coal? The standard forecast for coal (repeated innumerable times) has been that we have hundreds of years of coal. But quite a few recent estimates have challenged this rosy prediction. 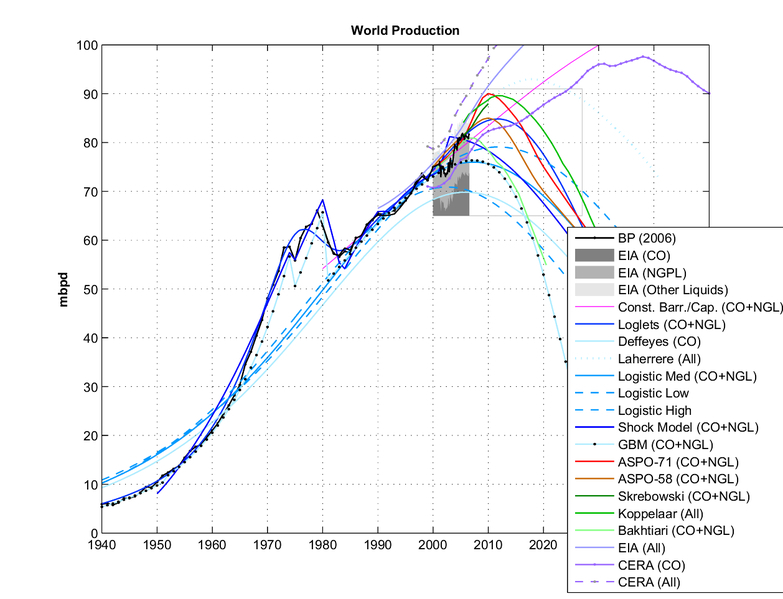 A group called the Energy Watch Group predicted in 2007 that global coal production could peak by the year 2022. Dave Rutledge of the California Institute of Technology estimates that by the year 2070 we will have used up 90% of the coal that will be burnt. If such an estimate is correct, it would presumably be good for the environment, because it would mean that the gloomier predictions of the IPCC regarding global warming would probably not occur. 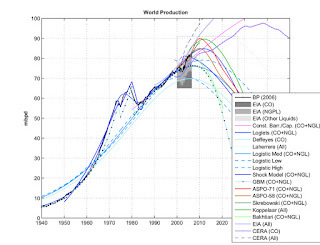 Such predictions are based on the assumption that man's production of fossil fuel will grow unabated. But if we see both a peak in oil production and a peak in coal production before the middle of this century, there will be a gigantic energy crisis that may include economic depression and possibly even mass starvation. With a growing population and growing consumption, we will need for energy supplies to keep rising steadily, but exactly the opposite may be in store. The shortfall may lead to a crisis which may in the short term be even worse than the global warming crisis. What about renewable energy? Won't that make up for the shortfall? Today the World Bank issued a report noting that despite the fact that wind power has grown at a rate of 25% per year since 1990, and solar power has grown at a rate of 11 percent since 1990, renewable energy overall is only growing at a very small rate. Renewable energy (most of which is hydroelectric energy) only makes up about 18% of our energy, and that percentage has hardly increased since 1990. If current growth rates continue, we'll only have a fraction of the renewable energy we need when our production of fossil fuels starts to sputter. Some optimists imagine that nuclear power may fill the gap, but things don't look very promising on that front. Scientists have been working for fifty years or more to create nuclear fusion (a clean form of nuclear energy), but we are still nowhere close to having a working nuclear fusion reactor. As for fission reactors, their cause suffered a great setback when the Fukushima reactor in Japan suffered a catastrophic malfunction. We can't wait until the next energy crisis explodes in our face. 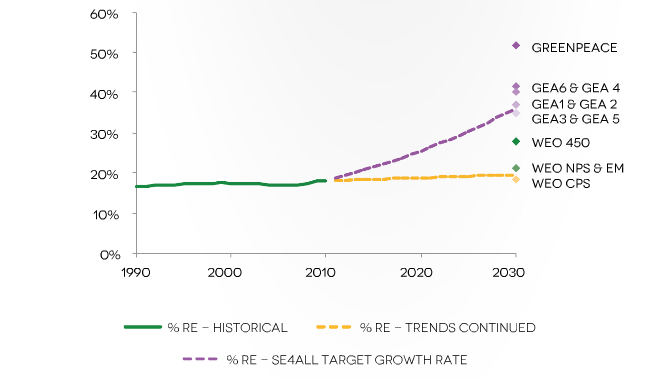 We have to put the needed renewable energy units in place years before we need them. China is making heroic strides in this area, but the West (including America) lags behind. What can the average person do? Reduce your energy use and slash your carbon footprint. When you jump in a jet liner to go from New York City to see mountains in some exotic country (when you could have enjoyed mountains in your same state), or when you live in a house of 2500 square feet (when 1000 would have done fine), you are helping to use up our dwindling reserves of fossil fuels. The end result in the future may be a family shivering in a cold house or a family going hungry. Who Will Prevail – Robots or Supermen? 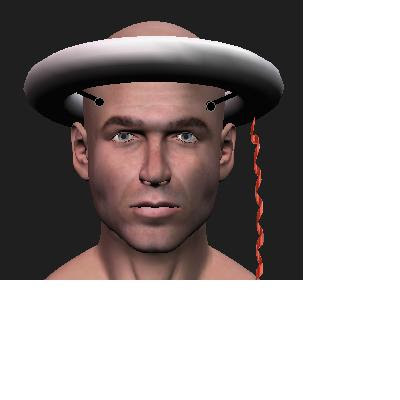 We are currently making great progress in artificial intelligence and automation. Moore's Law is the rule that the number of components that can be placed on a circuit board doubles about every two years. Assuming that Moore's Law holds true in the next few decades, we can imagine that by some time within the next hundred years robots may have intelligence equal to or greater than the current intelligence of human beings. Does that mean that robots are likely to take over the planet within 100 years? Not at all. There are two reasons why it is rather unlikely that robots will become the rulers of the planet within the next 100 years. The first reason is that it is quite possible that humans themselves may become smarter within the next fifty years or so. We are learning how to tinker with our own genes. Before long, we may discover genes that can be added or tweaked to give human beings more intelligence. So if we imagine very brainy robots inhabiting our planet at the end of the century, we can imagine that their rivals will not be people as intelligent as us, but perhaps people much smarter than we are. So let us imagine it is the year 2100. The world is filled with millions or billions of extremely smart robots. But there are also many people in the world with IQ's higher than 200. Which is likely to get the upper hand – the robots or the supermen? Some would argue that robots would have the upper hand, because humans have only a little extra room to store additional brain cells, but it is easy to make a robot that has twice as much of a CPU, or five times as much, or ten or twenty times as much. Imagine you were a master genetic engineer who can tinker with the arrangement of the human body. You couldn't simply design human beings with heads twice as big, because the head has to fit through the narrow slot of a woman's birth canal when a baby is born. So it seems we can't design humans that are, say, ten times smarter, unless we completely redesign the human body, which might be a nightmare. For robots, there is no such limitation. A robot can be almost any size or shape. Even if a humanoid appearance is chosen, the chest of the humanoid robot can be used to store additional CPU units. A robot can also have a non-humanoid appearance. If the robot looks something a battle tank, there will be abundant room to store large CPU units. So we can imagine robots with thinking units weighing 100 times more than a man's brain. That would seem to give robots the upper hand. But humans do have two very substantial advantages which may assure their predominance over robots for at least a century. The first advantage is that it is easier for humans to move around, without being tethered to any power cord, and without requiring any battery replacement or battery recharging. 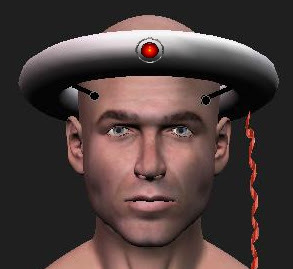 Imagine an extremely intelligent robot of the year 2100. How would such a robot get around? Today almost all robots need to be plugged in to an electrical source. Is there any way that a robot could be able to move around independently as a human does? We can imagine solar-powered robots like the Curiosity robot landed on Mars. But solar power can only provide limited power for any robot that is the size of a car or smaller, and the Curiosity robot is a slow-moving sluggish thing compared to a human being. Solar-powered robots may be quite useful, but are unlikely to be mobile enough to gain dominance over the human race. We can also imagine battery powered robots which recharge themselves using the electrical grid. But that would probably not be sufficient to give these robots the power to take over in a world in which humans control the electrical grid. Here is another reason why it would seem very difficult for robots to take over the planet within a century: for a long time it is going to be very hard for robots to self-reproduce (but it is very easy for humans to reproduce). An advanced robot is likely to be made from components that are manufactured in many places around the world through highly specialized tools and manufacturing processes. It is hard to imagine a robot within the next 100 years having the ability to make a copy of itself from metals and raw materials that can be scavenged outside of a factory. If robots are not able to independently self-reproduce in the next 100 years, they are unlikely on their own to duplicate themselves to reach a population level at which they can dominate us. We humans will still be in charge of how many of them there are. By reducing their growth, we can presumably keep our position as the lords of the planet, for quite a few decades to come. However, centuries from now this situation may change. Robots may well acquire all the mobility advantages of humans, and may well gain the power to reproduce themselves even faster than people can reproduce themselves. If that ever happens, our days as lords of the planet may be over. Scientists are busy looking for other planets like our planet. So far they have discovered some 889 planets. In addition, there are some 2712 “candidate planets.” These are cases where we have some data indicating that a planet probably exists at a particular place, but the data is not quite strong enough for scientists to conclude that the planet definitely exists. Most of these planets have been discovered by the Kepler Space Telescope, which unfortunately has recently suffered a mechanical glitch which has put it out of service for the time being. But scientists will be busy for years analyzing the huge amount of data that Kepler has already collected. Even if the Kepler Space Telescope takes no more observations, it will be regarded as one of the greatest success stories in scientific history. The Kepler Space Telescope mainly uses a technique called the transit technique. This technique is so simple that you could illustrate it to someone by using a light bulb and a rubber ball. Take the lampshade off a lamp, and tell someone the light bulb represents a distant star. Then revolve the rubber ball around the light bulb. Then ask the person, “How does your observation of the light bulb change when the ball passes in front of the light bulb?” The answer is that the observer sees less light from the bulb when the ball passes in front of it. The same thing happens (on a much different scale) to a telescope looking at a distant star when a planet passes in front of the star – for a short time a little less light is observed from the star. By taking repeated observations of a distant star over several years, and carefully analyzing dips in light from the star which occur at periodic intervals, scientists can detect planets around other stars. By exactly how much the light from the star dips, scientists can estimate the mass of these extrasolar planets. What astronomers are most hoping to find are potentially habitable planets – planets that could support the existence of intelligent life. To be potentially habitable, a planet must not be many times smaller than our planet or many times larger than our planet. If a planet is too small, it won't have enough gravity to hold an atmosphere. If the planet is too many times larger than Earth, it would presumably be a planet similar to the gas giants in our solar system (Neptune, Uranus, Saturn and Jupiter), which don't even have solid surfaces. To be potentially habitable, a planet must also be in a zone that is neither too close to the star which it revolves around, nor too far away from the star. This zone where planets are not too hot and not too cold has been called the Goldilocks Zone (after the famous story for children in which a little girl rejects one bowl of porridge because it's too hot, another because it's too cold, and finally picks a third bowl of porridge which is just the right temperature). 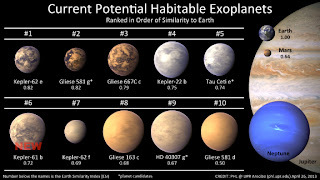 The image below shows the current state of the search for habitable planets. So far astronomers have found 10 potentially habitable planets. Their relative sizes are shown below. All of these planets are in the Goldilocks Zones of the stars they resolve around. The decimal number under each planet is an estimate of how similar to Earth the planets are. The closest matches (with a similarity index of .82) could well be very similar to Earth. We will apparently have to wait until 2017 for the next great breakthrough in finding potentially habitable planets. In that year NASA will launch the Transiting Exoplanet Survey Satellite (TESS). It will have capabilities much greater than that of the Kepler Space Telescope. Some predict that this satellite will be able to discover between 1000 and 10000 planets. Our Earth is the only planet in our solar system that is highly hospitable to life. So if we want to find any planet like our own, we must dream of traveling to planets revolving around other stars. The Kepler Space Telescope has discovered more than 100 planets and more than 2000 planet candidates. Some of these are Earth-sized planets in the habitable zone, meaning they might bear life. Scientists estimate our galaxy of more than 100 billion stars could easily contain more than a billion life bearing planets. But while the stars offer the most enticing imaginable opportunity for exploration, the task of being able to travel to the stars is one of the most difficult imaginable technical tasks. The main problem is the incredibly vast distance between stars. The nearest star is Proxima Centauri, part of the Alpha Centauri star system. It is about 40 trillion kilometers away. This is such a great distance that light takes more than 4 years to traverse it. Now you might think: no problem, we'll just keep building rocket engines more and more powerful, until we can get there in a flash. Unfortunately, nature has told us: you can't do that. According to Einstein, nothing can travel faster than the speed of light. That means that even if we could build the most powerful spaceship possible, it would still take four years to get to the nearest star. If you wanted to take a grand tour of ten or twenty stars (similar to a voyage of the starship Enterprise), that would apparently take a lifetime or longer. In fact, there are practical engineering reasons why it seems unlikely that any interstellar starship (basing on conventional rocket principles) could reach a speed of more than about half of the speed of light. One can imagine a spaceship that used antimatter as the rocket fuel (which would release incredible amounts of energy). One can also imagine a spaceship that scoops up matter between the stars, and uses that as rocket fuel (a type of design called a Bussard Ramjet). But given various engineering limitations, it would seem to be all but impossible to build any starship (using conventional rocket principles) capable of traveling faster than half the speed of light. Would this rule out the possibility of humans traveling to the nearest star? No. We are used to space missions that last a few days or months (and have imagined space missions to Mars lasting a few years). But even without imagining an extension of the human life span, it is easy to imagine a twenty or thirty year interstellar voyage. A spaceship can easily be designed with artificial gravity. It would simply need to have a large spinning centrifuge similar to the one depicted in the movie 2001: A Space Odyssey. 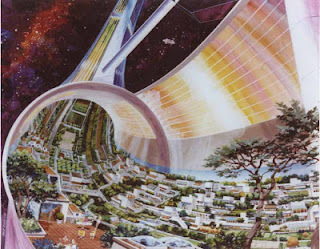 If the spaceship crew lived inside the rim of a large spinning wheel (preferably one of at least 50 meters in width), the crew would experience artificial gravity similar to the gravity on Earth. If such a spinning habitat were made large enough, it could provide a comfortable home that a crew could live in for a voyage of twenty or thirty years. Then when the spaceship arrived at the distant star, the crew could colonize or explore the planets revolving around the star. For such an approach to work, the crew might have to be quite young when the spaceship left Earth, presumably no older than 18 or 20. Under this scenario (assuming no extension of the human lifespan), it would probably not be practical to imagine the spaceship returning to Earth after an interstellar journey. But that would not be much of a problem, because the crew of a starship could use radio and television transmissions to beam back to Earth all of its discoveries. There would be a gap of at least four years before the television transmissions reached the Earth. What if we wanted to explore other more distant stars, using these types of spaceships traveling at no more than half of the speed of light? It could be done, but it would be a long slow affair. After reaching a planet revolving around another star, a starship could colonize that planet. Eventually a new expedition to another star could be launched, using young crew members from the colony. If the colony became really advanced, it might build its own starships and send them out to colonize or explore nearby stars. In such a manner the human race might spread out very slowly among the stars. But the rate of expansion would be very slow if we could not build ships faster than the speed of light. The discussion above assumes that we could build a spaceship capable of traveling at a decent fraction of the speed of light (perhaps 25% of the speed of light, or 50% of it). But what it proves too difficult to travel at such speeds? What if we can't make any ship traveling faster than 5% or 10% of the speed of light? In such a case there are still two ways we could explore the stars. The first method is simply robotized exploration. We would have little difficulty creating robots that could endure a long interstellar journey of a hundred years or more. The second method is the approach of creating a multigenerational starship. A multigenerational starship would be a kind of traveling miniature slice of the planet Earth. The idea would be that the original passengers would bear children on the starship, and live out the rest of their lives on the starship before it reached its destination. Their children would do the same thing. Finally, after the passage of many generations, the starship would arrive at a planet revolving around another star. The passengers at that time would be people who had never lived on Earth. Such an approach seems perfectly feasible, and requires no technical breakthroughs. The ship would have to be a large one that provided artificial gravity to its passengers. But we already know exactly how to do this. You simply build a large torus-shaped structure (the same shape as an inflatable ring), and have the starship passengers live on the inner rim of the huge structure. As soon as you start rotating the structure, it would produce artificial gravity through centrifugal force. Still another possibility is that of having a starship crew spend years in a kind of deep freeze, through some kind of hibernation or suspended animation. That would require a major breakthrough, which is not required to launch the multigeneration starship. I have discussed here relatively slow methods of interstellar travel, which require no huge technical breakthroughs. There are other possibilities for faster interstellar flight, involving exotic (and perhaps improbable) breakthroughs such as warp drives. I will discuss those in another post. One of the hottest topics in futurology concerns the possibility of what is called a technological singularity. Those who imagine a singularity postulate that computers will keep getting faster and smarter, following the trajectory of Moore's Law (the rule that every two years there is a doubling of the number of transistors that can be packed on a circuit board). Before long, it is argued, we will be able to fit the computing power of a hundred human brains on a single desktop computer. Presumably this will lead to the emergence of computerized superintelligence. This emergence of superintelligence (in what is called an “intelligence explosion”) is referred to as the singularity. 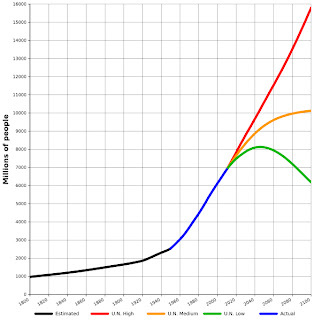 The term singularity was popularized by Ray Kurzweil in his book The Singularity is Near. Kurzweil predicted that this singularity would occur around the year 2045. His book contains quite a few logarithmic diagrams plotting the growth of computing power over the past twenty five years. 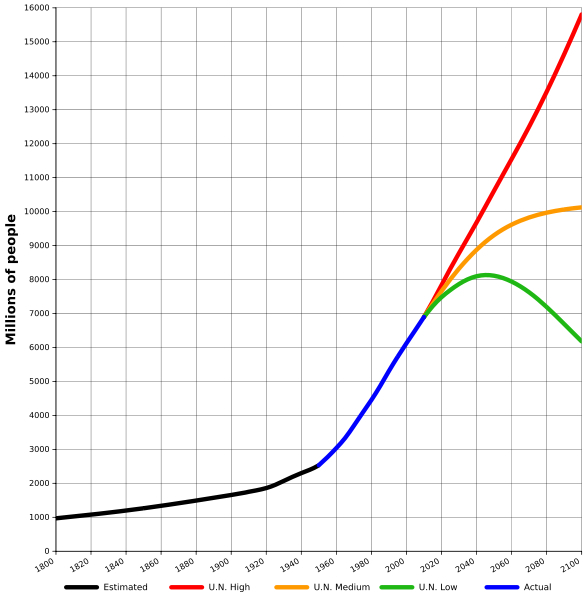 Extending the trend line a few decades into the future, he estimates that within a few decades the total brainpower of all computers will match the total brainpower of all humans. Singularity enthusiasts postulate that soon this “intelligence explosion” will lead to computers that are far more intelligent than humans. Singularity enthusiasts also imagine there will before long be a merging between computers and men, allowing people to have their minds connected to computers or enhanced by computers. If someone tries to cite possible limits to how small silicon chips can be miniaturized, advocates of a singularity will mention other promising technologies such as quantum computing and biological computing, which may well allow Moore's Law to continue for many decades, with computers basically getting twice as fast and powerful every two years. However, there is a huge bottleneck that well may mean that such a singularity does not occur anywhere near as quickly as its advocates predict. The bottleneck is software. Large advances in computer intelligence require equal progress on two different fronts: the hardware front and the software front. To create a computer as intelligent as a human being, you would need not only hardware vastly better than anything available today, but also software thousands or millions of times better than anything available today. Unfortunately the annual progress rate of software is much slower than the annual progress rate of software. Software development progress does not at all follow any rule of progress as dramatic as Moore's Law. At what rate of progress is software improving from year to year? There is really no exact way to answer this question. Any answer is a subjective judgment call. In his book Kurzweil estimates that software is improving at a rate of doubling in power every six years. But he provides no reasoning to back up this claim, and it seems that he just kind of picked the number out of a hat. As someone who has worked in software development over the past twenty years, I can say that from a development standpoint it doesn't seem like software is four times more powerful than it was twelve years ago. In 1997 programmers would develop programs mainly by using compilers with graphical user interfaces, the internet, object oriented languages, and class libraries. That's exactly how programmers develop software today. But to be generous to singularity enthusiasts, let's suppose that figure is correct. If software doubles in power or excellence every six years, it will still mean a huge and growing gap between our future advancement in software and our future advancement in hardware. hardware power every two years, and double software power every six years. This table uses a number of 1000 as an arbitrary starting point. What we find is that by the year 2043 computer hardware power has increased by a factor of 32,000 times, but computer software power has increased by only 32 times. The end result is that computer hardware ends up being 1000 times more powerful than computer software. What does this mean in practical terms? It suggests that the technological singularity will not occur anywhere near as quickly as singularity enthusiasts imagine. We will not at all have anything like superintelligent machines (or even computers as smart as human beings) if they are using software that is only 32 times better than today's software. We probably won't have computers as smart as human beings until we have software that is many thousands of times better than today's software. This gap between the fast rate of progress of hardware and the slow rate of progress of software is called the software gap. The software gap may mean that you won't see any singularity in your lifetime unless you are young. There are currently singularity enthusiasts in their fifties who imagine that they will be able to escape death by uploading their minds into computers or robots, after computers and robots become as intelligent as people. I have no such hope. I don't think the software will be ready before I die. On the planet Seldauria all of culture revolved around the Museum. The Museum had started out 40,000 years ago as a single building storing artifacts from the history of the planet. But when the Seldaurians began to explore other stars, the scope and extent of the Museum expanded greatly. The Museum became an institution storing everything that the Seldaurians had been able to discover about the history and culture of other planets. The Museum became a repository for all the treasures the adventurous Seldaurians brought back from other star systems. After doubling and tripling in size several times, the Museum eventually became the size of a large city. The Museum now consisted of thousands of buildings in the same city, and some of the buildings were gigantic domes the size of mountains. As there was no institution so vast anywhere for hundreds of light years, the Museum became a place of pilgrimage to many other races on other planets. On many planets the highlight of someone's life would be to travel to Seldauria and see the endless treasures of the Museum. Most who came would spend at least a year exploring its exhibits. It was not uncommon for visitors to report that they had spent the past ten or twenty years visiting the Museum and its countless buildings. It was commonly said that it was better to see the Museum at Seldauria than to explore fifty planets. On Seldauria none had greater prestige than the uniformed priesthood known as the Curators. The Curators performed many roles. One of their roles was to negotiate with the captains of many starships that came to Seldauria. 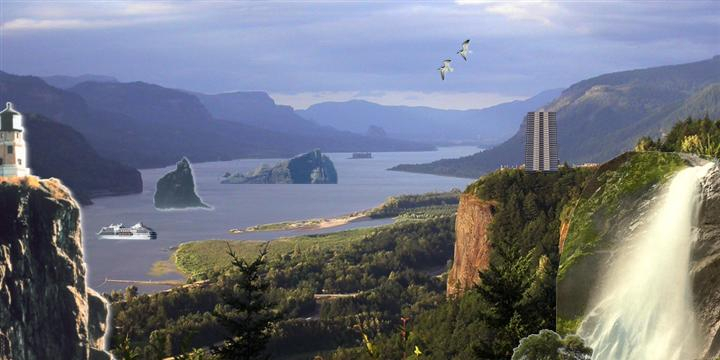 For thousands of years the Seldaurians had been broadcasting radio signals advertising that great treasure would be paid to any ship that visited Seldauria with historical and cultural artifacts. So every few years starships would arrive at Seldauria filled with items that the Curators paid richly to acquire. The Curators also designed the buildings of the Museum, making sure that space was allocated appropriately, and that the grandeur of the buildings was proportional to the grandeur of the galactic history they recorded. To store all the artifacts from the Dauryan Empire, the Curators erected a dome that was a thousand meters tall, which was a fitting scale to commemorate an empire that stood for 100,000 years. 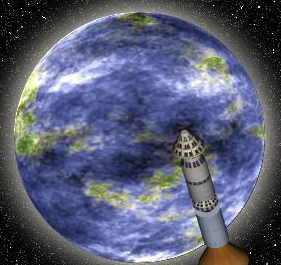 To store all the treasures obtained from the Ventic League of Planets, the Curators built a tower of 5,000 meters, with each meter representing one of the planets or moons that made up this enormous confederation. Also having great prestige on Seldauria were the brave adventurers known as the Gatherers. The Gatherers were sworn to the mission of exploring other planets for the sake of acquiring new artifacts for the Museum. The Gatherers left Seldauria in gleaming starships that were almost empty. They came back many years later with their ships crowded with artifacts that would be handed over to the Curators, who would assign the artifacts their proper place in the Museum. Three of the Gatherers were Yauri, Cyton, and Delnon. Aided by a large task force of robots, they arrived one day at a life-bearing planet that had seen better days. “So let's go down and try to get some things for the Museum,” said Yauri. The three Gatherers and their robots went about exploring the planet. 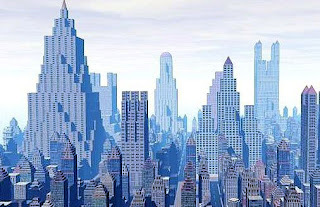 They were quickly able to find the shattered ruins of a city, which was buried under many centuries of plant growth. The hand of Time had felled what few buildings remained from the original catastrophe, and the ruins were covered with moss and vines. “Any idea of what caused their downfall?” asked Yauri. “Do you think that happened before or after the nuclear war?” asked Cyton. Using a small communication device, Yauri queried a computer on his starship. The computer informed him of a promising lead. There were indications that an underground repository had been discovered outside of the ruined city. Yauri had some of his robots dig up the ground to find the repository. The robots came back with a steel chest retrieved from thirty meters underground. After some fiddling the three Gatherers were able to open the box. Inside the steel box were various small artifacts and some photographs. Yauri lifted up the largest of the artifacts. It was a rectangular piece of fabric attached to a bronze-colored spear-like pole. The fabric consisted mainly of alternating stripes of red and white. On the top left corner of the fabric was a blue rectangle, and within that blue rectangle were 50 white stars, neatly arranged in nine rows. “What do you think this is?” asked Yauri. After the Gatherers returned to Seldauria, these artifacts were eventually displayed in the Museum. But the Curators deemed that the obscure insignificant planet merited only a small place in the Museum. So only one small room in the vast Museum was allocated to hold the artifacts from the planet and its mysterious vanished civilization. In the previous blog post we looked at some of the reasons for being pessimistic about the ability of mankind to meet all its food needs in the 21st century. Now let's look at some reasons for being optimistic that mankind will be able to meet its food needs. Over the past ten thousand years the number of persons fed per acre of food has grown by a factor of perhaps a thousand times. Back around 6000 BC it would take perhaps 100 acres to feed a single person, because both the planting of crops and the picking of crops was very inefficient. These days a single person can be fed by only a single acre. Modern day tractors are many times more efficient than the horse-drawn plows used long ago, and modern day reapers are many times more efficient than a single person using a scythe or cycle to cut and gather crops. We can assume that with the growth of technology this trend will continue. Given that Google is making fantastic strides in developing self-driving cars, we can imagine there will be soon be robotized tractors and planting machines that will be able to plant crops more efficiently than we can do today. We will presumably also have robotized crop reaping and crop picking machines that will allow grown food to be reaped far more efficiently than today. Moore's law is the law that processor power roughly doubles every two years. Because of factors such as Moore's law, you can now buy a computer a hundred times more powerful than was available a few years back, and you can also buy it at a much cheaper price. If we assume that Moore's law will continue in the next decades, it may well be that within a few decades super-efficient agricultural machines become available at a low price throughout the world. If that happens, the food production per acre for the rest of the world (currently about 1.5 tons of grain per acre) may catch up to the current US food production per acre (currently a little less than 3 tons of grain per acre). If that happens it would probably be enough to meet the world's food needs. It is estimated that we will need a productivity of 2.5 tons of grain per acre to feed the world by 2050. Another factor that may increase the productivity per acre is the development of new genetically engineered crops. Scientists are working on new genetically engineered crops that will require less water, produce more food, require less fertilizer, and require less pesticide. A single breakthrough in this area could produce a huge increase in global food production. The concept of eating insects is unattractive to most US citizens, but the United Nations recently stated there is a huge potential for increasing global food production by supplementing food with insects, which can be an excellent source of protein. Such a possibility is at least something that could be used as a last resort to stop famine. There is also a huge potential for increasing food supplies by decreasing global consumption of meat, and using more land to directly grow crops rather than using the land for raising livestock. Raising livestock such as cows and pigs is a very inefficient way to produce food. The amount of land and energy needed to produce a single kilogram of beef would produce ten kilograms of grain. The production of livestock is a major cause of global warming. It could well be that in the future more and more people will become vegetarians to help reduce global warming. If that happens (and grazing land is converted to grow grain), global food productivity may increase sharply. Another reason for hope is the possibility that 3D printing technology will be harnessed to help improve global food supplies. We are currently seeing explosive growth in this technology, which uses a “layer by layer” approach to manufacture items entirely different from the factory production technique. Some scientists think that in the future people will have 3D printers that allow them to create food items from raw nutrients, in a very efficient way that bypasses the whole traditional agricultural process. Despite all these reasons for optimism, there is still a significant risk that in this century there will be a huge shortfall between the amount of food we need and the amount of food we produce. You can do your part to help minimize this risk by sharply reducing (or ideally even stopping) your consumption of meat, particularly red meat. If you don't have the willpower to be a vegetarian, try skipping meat every day or 5 days a week. You will help decrease global warming, and decrease the chance of starvation in the future (not to mention decrease your chance of getting cancer and heart disease). One of the great clouds hanging over this century is whether we will be able to feed the rising human population. Already millions go to bed hungry every night, but what will happen when the human population grows much greater? Will there perhaps be mass starvation? Let's look at the issue from a pessimistic standpoint and an optimistic standpoint. Today's post will look at the pessimistic case. Tomorrow's post will look at the optimistic case. 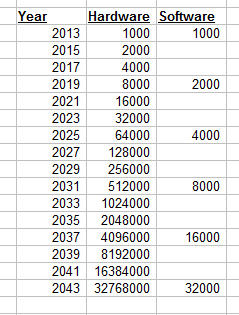 the second projection, the population will grow to 10 billion. 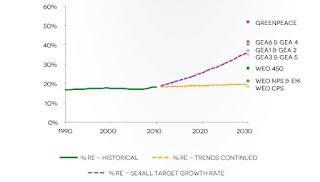 According to the third projection, the population will grow to 8 billion, and then begin to decline. Most likely, there will be a much greater need for food supplies as the population grows. However, the production of food is critically related to the availability of fossil fuel energy supplies, particularly oil. Oil is used throughout the process of producing and transporting food, most notably in the production of fertilizers and in shipping and trucking food products. But global oil production may have peaked, or may be near to peaking. As we can see from this graph, many experts predict that global oil production will soon begin to decline very substantially. Such predictions shouldn't be surprising. Oil is a non-renewable resource created from biological and geological processes that occurred millions of years ago, over the course of millions of years. We know that oil production in the United States followed a bell-shaped curve, reaching its peak around 1970. 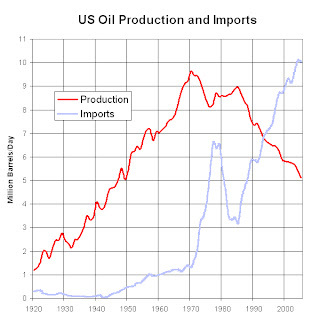 The US's current oil production is only a little more than half of what it was in 1970. Many countries around the world have experienced the same bell-shaped curve, and have oil production much lower than it once was. So what will happen to our food production if oil production declines sharply? With a rising population, the most likely result may be mass starvation. There would seem to be a high chance of mass starvation involving many millions of people. Since modern food production is so dependent upon oil, it seems that to adequately feed a growing population, we need a sharp increase in oil production, but the exact opposite may be in store. Much of the world's food comes from fishing, but fish stocks are being stressed around the world. All too efficient methods such as bottom trawling are leading to situations where some areas now have few of the fish they have provided for food in the past. The UN Food and Agricultural Organization estimates that coastal fisheries have declined by 50% in the past 30 years. Another factor to consider is global warming. As the temperature rises in the decades ahead, it may have a negative effect on global agricultural production. Temperature rises lead to more droughts. Temperature rises increase the need for irrigation. Warmer winters will mean that fewer insects will be killed off during the winter, leading to an increase in some insect populations that may threaten crops. In fact, as population grows, more and more of the world's forests are being turned into farmland, which may itself increase global warming (since forests soak up the carbon dioxide that is causing global warming). There is also the fact that fresh water supplies are becoming more and more stressed, which may have a very negative effect on our ability to irrigate farmland. In this model food production hits a peak a little into the 21st century, and then starts to decline, partially because of declines in resources (which include oil and also fertile soil). After a lag of a decade or so, population starts to plummet, presumably because of mass starvation. So is this what the future has in store? Perhaps not, because there are some optimistic factors to consider. We will examine those in the next blog post. In this blog I will examine (through news, opinions and stories) two things that have fascinated me since boyhood: the external universe and the future of mankind. I will be exploring topics such as the growth of technology, the discovery of other planets, the search for extraterrestrial intelligence, our economic future, and the prospects of human survival. Some blog posts will be hopeful, touching on glorious discoveries on the horizon, and thrilling achievements within man's grasp. Other blog posts may be much more gloomy, as I touch on troubling topics such as man's degradation of the environment, and the huge difficulties that lie ahead because of man's depletion of fossil fuel resources. I hope to strike a balance between optimism and pessimism. Because certain concepts can best be illustrated through the use of fiction, I will occasionally use fictional postings, always identifying a posting as fiction whenever it is just a story.